This case study is about the opening up of data around sports & leisure activities in the Scottish city of Aberdeen. The project was nominated for an Aberdeen City Council Star Award in the Innovation category. Legacy of 2014 Glasgow Commonwealth Games is to encourage people to be physically active. With no specific guidance given, the attendees were asked to come up with any problems they would like to be solved at the event. It was through these open discussions that the problem of people not being aware of what sports & leisure activities were available was identified. Is the problem real for other people? Technology projects often have a reputation of creating a solution for a problem that does not actually exist. In the work we do we make it a priority to ensure that there is actually a problem that needs solving rather than just someone has an idea because they think their data is important. Due to the fact that the problem of lack of discoverability was identified at a hack event, we were provided with an immediate audience to verify that it was a genuine issue. What physical activities do you do? Where do you do these? What stops you doing activities? How do you currently find out about activities? What devices do they use apps on? Does the brand of an activity’s venue affect your decision to take part? 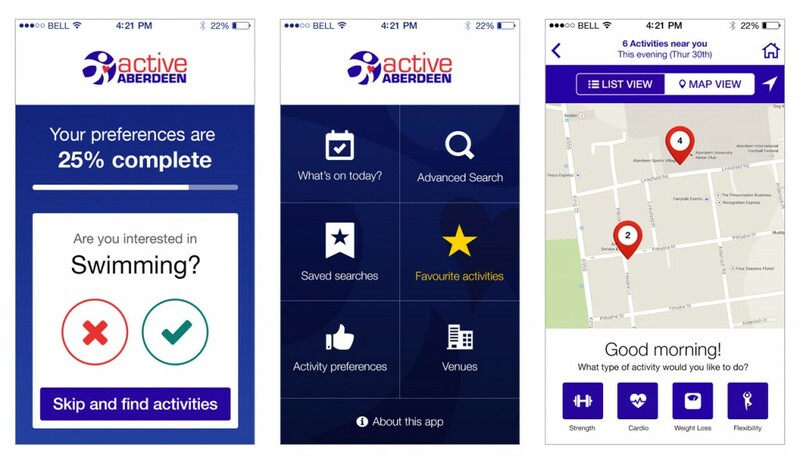 Would you use an app to find activities? How active would you rate yourself on a scale of 1 to 7 (1 – inactive, 7 – very active)? The results of the survey confirmed that there was interest in being able to discover activities using mobile apps. As a proof of concept, during the hack event, information about classes at the various sports centres and other leisure facilities in the city was scraped (read from websites by software) or manually copied from various venue websites. This gave us around 600 specific classes taking place every week. On the back of this demo data we gained access to the official data feeds that provided the content to some of the venue websites. Crowd sourced ‘sweat ratings’ for each class – this allows people to get an idea of how much effort is required, as an intermediate level can mean different things to different people. No project ever runs smoothly. When it comes to Open Data some people can be very protective of their data that you wish to open. Not all venues were willing to provide data. Some venues were concerned that being on a list with newer venues would mean people wouldn’t wish to use theirs. Some venues were concerned that people would confuse facilities provided by older venues with the kind of facilities they offer. Not allowed to open the backend official data feeds directly as they didn’t want to have their services overwhelmed. How was the data consumed? Apps have been developed for both iPhone and Android devices that allow people to find out what sports & leisure activities are available to them. We are currently in the planning stages for providing a web based service that will easily allow health professionals to not only suggest activities for patients but also where and when to do them. This will remove the barrier of people being told they need to do some form of exercise but then leaving it down to them to find out where to do it. Having a community around your Open Data helps keep it alive. We have seen this start to happen with this data. Several teams of developers who attended a second CodeTheCity hack event in Aberdeen began work on their own projects using the data we had opened. Who benefited from the data being opened? A common barrier to opening data is the question of ‘Why?’. Being able to show a real benefit helps remove this barrier. Was there a reuse value? Solving a problem once is great. Being able to reuse the ideas or technology to solve the problem elsewhere is even better. Whilst attending a hack event in Edinburgh, we were able to extract their Sports & Leisure information and use the same platform to provide structured Open Data about their classes.